Abrasives are not only used to prepare and smooth the wood surface, but are also used for between coat sanding and defect removal. We stock grits ranging from 80 to 2000. 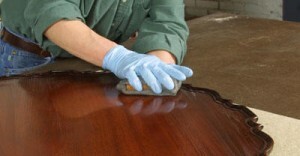 Polishing and rubbing compounds put that final smoothness on your finish. Watch this video as Jeff shows some tips for fixing flaws in the wood before finishing.